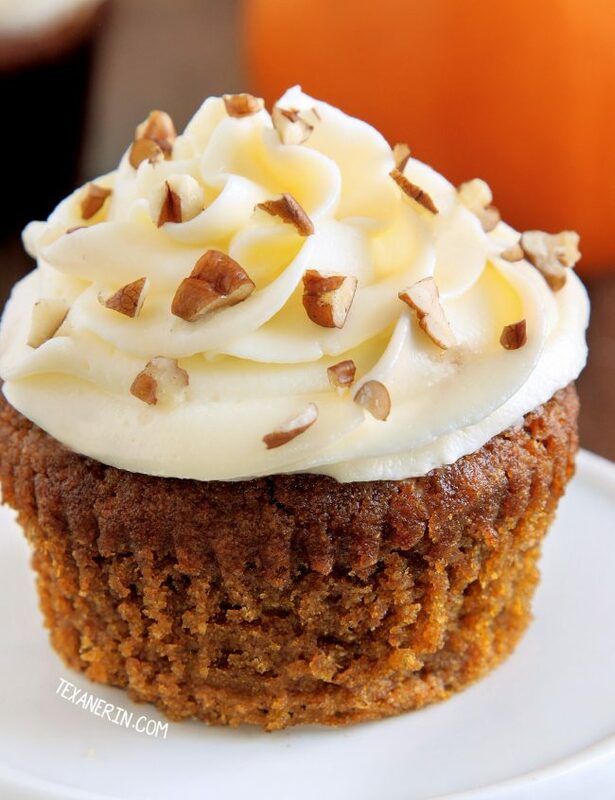 These pumpkin cupcakes are super moist, incredibly delicious and topped off with cream cheese frosting (with a dairy-free option). Can be made with gluten-free, 100% whole grain or all-purpose flours. Scroll down for a how-to recipe video. Well. 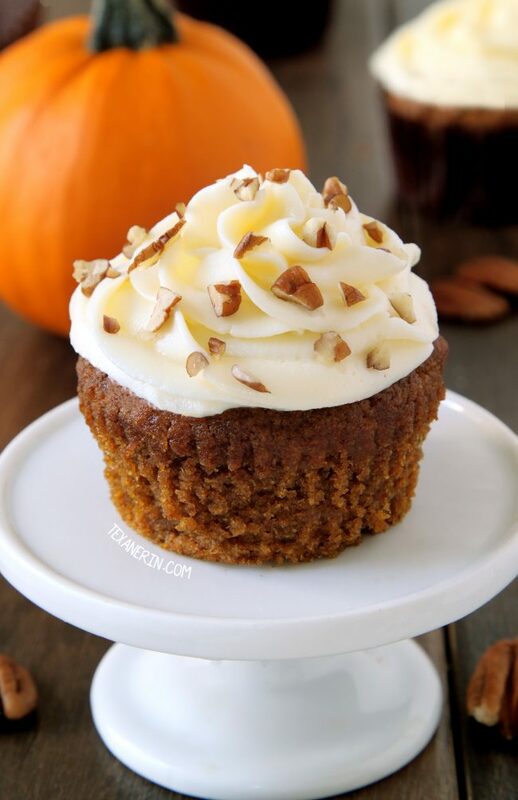 I can’t say that I’ve tried every pumpkin cupcake recipe in existence but I have tried over 40 and these are definitely, without a doubt, the best I’ve ever had! I wish I could take credit for it but it’s adapted from an Ina Garten recipe. I posted this recipe a few weeks after I started blogging in 2011 and it’s so good, I figured I should test a gluten-free version, reshoot the pictures and post it again. If none of the three flour options work for you, try my paleo pumpkin cake! This is the lightest and fluffiest cupcake I’ve ever made. It was the most MOIST cupcake I have ever made or eaten. So delicious and amazing! One of the moistest cupcakes I have ever made even when I changed the recipe. And my favorite: My daughter ate 5 in a short while and she was full. I did not even bother to feed her dinner. All of the reviews above and in the comments refer to the whole wheat version but I can assure you that the gluten-free version is just as delicious as the whole wheat version, which is just as delicious as the all-purpose flour version! I shared my pumpkin cream cheese muffins two weeks ago and several of you have already made them and loved them. So you might be wondering what the difference is between the two pumpkin batter bases. They’re really similar. This one has more sugar, more oil and more pumpkin than the other (for the same yield). I’d say the difference is in the crumb. These are more cupcake-like. These pumpkin cupcakes are sweet enough without the cream cheese frosting but what would a cupcake be without cream cheese frosting? I used a scaled down version of my healthier cream cheese frosting. It pipes really well! If you need a dairy-free version, try this vegan maple cream cheese frosting on them. Just note that it’s very soft and you won’t be able to pipe it on! If you’re looking for a great cupcake recipe for Halloween, these pumpkin cupcakes are for you! And if you want something a little orange and something a little black, try these whole wheat chocolate cupcakes, which can also be made with AP flour or gluten-free flour! If you’re not feeling the cupcake love, try these iced pumpkin cookies from A Dash of Sanity or these pumpkin chocolate chip muffins from Melanie Makes! Preheat the oven to 350 °F (175 °C). Line a muffin pan with 10 muffin liners. In a medium bowl, sift together the flour, baking powder, baking soda, salt, cinnamon, ginger, and nutmeg. In a larger bowl, whisk the eggs, pumpkin puree, sugar, and oil. Add the flour mixture to the wet mixture and stir just until combined. Do not over mix! Divide the batter among the liners, filling each about 4/5 full, and bake for about 20 -24 minutes, or until a toothpick inserted in the center comes out clean. Once the cupcakes have cooled completely, prepare the frosting. Gradually beat in the powdered sugar until totally combined and then beat in the salt and vanilla. If it's firm enough for your needs, frost your cupcakes now. The frosting yields enough for just slightly more than 2 tablespoons per cupcake. If you want it firmer, refrigerate for about an hour, stirring the frosting after about 30 minutes. Don't let it chill too long before frosting your cupcakes, though, because it gets quite firm, like a cream cheese tart filling. If that happens, just bring it to room temperature and then frost. The frosting firms up once refrigerated so if you want the softer frosting texture (rather than a cream cheese tart filling kind of texture), let the cupcakes come to room temperature before serving. Store frosted cupcakes in the refrigerator for up to 3 days or in an airtight container at room temperature for 2 days. If you use olive oil, the batter will taste like olive oil but the taste disappears after baking. Here is the original frosting recipe I had listed on this recipe. I thought it was way too much for only 10 cupcakes and this newer version has less sugar. If you live outside of North America and have the kind of cream cheese that's meant for toast (that comes in a little plastic tub) rather than American style brick cream cheese, then get 300 grams of cream cheese, place it in the center of a cheesecloth, and wring out the liquid until you have 225 grams of cream cheese left. If you want to pipe this frosting, use 4 tablespoons of butter and if you just want to slather it on, use 2. Or 4 if you just want it a little firmer! 113 comments on “The Best Pumpkin Cupcakes (gluten-free, whole grain, dairy-free, all-purpose options)” — Add one! I just made a batch to test before Thanksgiving and they are wonderful. Very moist and a great taste. Awesome! I was looking for a sugar-free cupcake recipe for my daughter’s 1 year birthday in October, and thought pumpkin would be cool, and found this! Cannot WAIT to try it!!! I hope you’ll enjoy them! But they’re not sugar-free. Are you going to use some kind of sub? I’d love to hear how they come out! Hi,, nice taste but it wasn’t crumbly fluffy as the pic!! 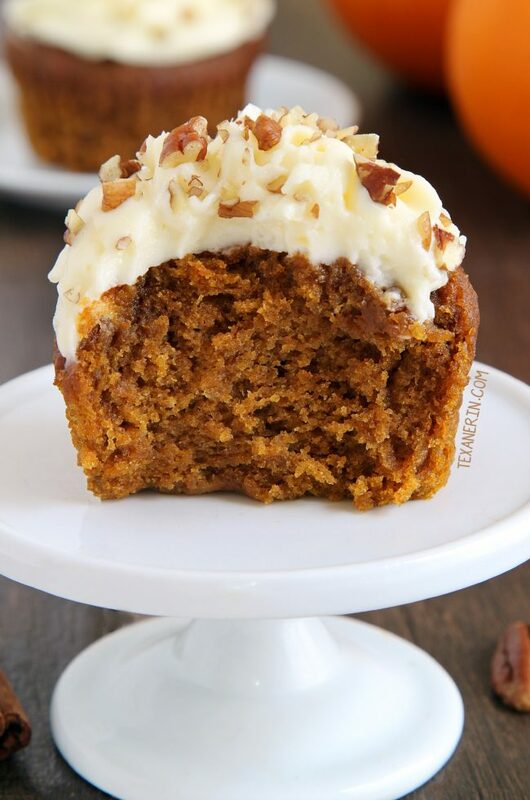 These are absolutely the best cupcakes, pumpkin flavored or otherwise, that I have ever tasted. I CANNOT believe that they are gf/df. THANK YOU FOR THIS RECIPE!!! It will be forever on our yearly pumpkin bliss list. I am so sorry for just now seeing your comment! We just got back from a vacation where I had internet reception very infrequently. And you’re welcome for the recipe! I’m thrilled that you enjoyed them so much. :) Thanks for your feedback! As if I can’t get enough sugar lol I am so in love with all of your recipes I’ve tried; they always turn out perfectly and taste like gluten with any combination of gf flours I’ve tried!! My kids and I cant get enough! Thanks for all your hard work! Do you have a book for sale? Can I substitute the eggs with flax eggs to make them vegan? I haven’t tried it so I can’t say for sure. I’m thinking it’d work but I’m not positive. Sorry I don’t have a definite answer for you! Can this be made as a 8 inch round cake? If so what would the time be? I haven’t tried a round 8″ but an 8″x8″ works! I did it in this post – pumpkin cake with mascarpone frosting. I baked it for 20-25 minutes. And sorry for my slow reply (Christmas chaos got in the way!). Just made these for Thanksgiving and they were a huge hit! The gluten free version…. Will definitely be keeping this recipe. Thank you for sharing!! You’re welcome! I’m very happy to hear that they were a hit. :) Thanks for your comment! Just a heads up you forgot to mention in directions to add the vanilla in with the wet ingredients! Making them now for my sons 1st bday party! Looking forward to how they are gonna turn out! Never mind!! 😂 that’s for the frosting! Welp there’s vanilla in my batter too now! Sorry my bad! Sorry for the slow reply! Have been in the hospital giving birth. :) Thanks so much for letting me know! Will fix as soon as I get back to a computer. Hope your little one had a great birthday! I made the gluten free version yesterday for Halloween and they were a HUGE hit! Thank you for such an easy and delicious recipe! I would like to make again for Thanksgiving but as a cake – do you think the same quantities would work in a cake format? Dairy free, but cream cheese and butter in your frosting? Hi Erin, I am trying these for Halloween and have fresh pumpkin, do I cook it, mash it and use the same quantity you use from tinned one? Hi Wendy! Yes, you’d use the same amount as canned. Here’s a recipe for homemade puree in case you need it. :) I’d love to hear how the cupcakes come out! I made the cupcakes and they turned out pretty good all things considered hahaha. They were my first cupcakes ever, the scale wasn’t working and my cases were small, so I ended up making 4 batches of them, however they rose well. I’m making them again but next time I will add a little bit more spices. Thank you so much for your recipes, I will be trying more of them. Hi again! I’m happy to hear that they came out well. :) I hope you’ll enjoy the other recipes just as much! Thanks for coming back to let me know how they came out. I simply just love your baking style and have made many of your dishes! Thank you for all your posts and creative mind! :) Quick question: can I use almond or coconut flour instead of the all purpose or would that change the consistency of it?